Thinking of upgrading your existing attic or crawl space insulation? Our Comfort Home Gold Package for attic and crawl space insulation gives you premium insulation installation to help your home save more money! Contact us to learn why you should upgrade to the Gold Package today! Our clean slate package. 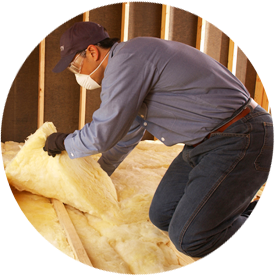 We start by removing all existing insulation from your attic and start from scratch. The Air Sealing Package is upgraded and when complete, you will have a sealed attic with new R-38 blown in fiberglass or cellulose insulation. Our premium package, involves applying BASF sprayed polyurethane foam to the floor joists once the existing insulation has been removed from your crawl space. Spraying at least 3 inches of polyurethane foam to the floor joists is equivalent to an R-19 and acts as a vapor retardant. Are you interested in knowing what our Gold Package can do for your home? At Tidewater Insulators, we offer FREE existing home energy audits for homeowners in the Norfolk, Hampton Roads, Virginia Beach, Newport News and Richmond, VA area to make sure you are getting the premium insulation you need! Schedule an appointment today or call us to learn more about our insulation packages!